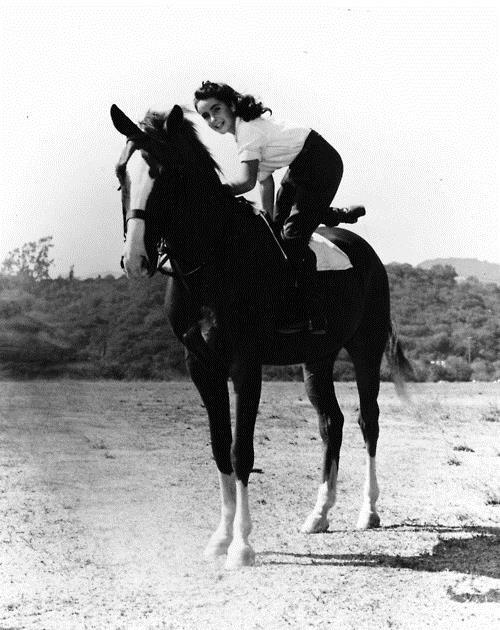 I must have been 6 years old the first time I watched the 1944 film National Velvet. I have always been one of those horse girls and for me, at such a young age it was like winning the lottery to be introduced to a character as independent, ambitious and clever as Velvet Brown. The story based on the novel by Enid Bagnold, follows 12 year old (aw) Elizabeth Taylor as Velvet; the youngest of 3 sisters with a passion for horses. After winning an ‘untameable’ horse in a raffle she finds herself posing as a man, determined to compete in the prestigious, all male, Grand National. If that’s not sassy I don’t know what is! The film is empowering on many levels. Velvet’s mother (Anne Revere, who actually won an Oscar for the role) swam across the English Channel and supports Velvet, remembering her own experiences with sexism. Not only does the film show women doing what they want and following their dreams and all that fantastic stuff, but it also displays family and the relationship between siblings in a kind of magical way. The family dynamic in general is a good one, with Mr and Mrs Brown seeming to equally run the household, and it’s Mrs Brown who supports velvet financially as well as emotionally through her journey. An added bonus: National Velvet passes the Bechdel test with flying colours. One of my favourite moments in the film has to be when Velvet is dragged home early from school, only to learn the reason of this is just a ‘silly boy.’ Most conversations between women are about horses, dreams, and independence. Although of course the film is outdated and ridiculously lacking in racial diversity the fact that Velvet embarks on a journey so huge in a time where so many women are portrayed as passive and timid is significant. She is a young woman with ambition who is not an object or a decoration but an active manifestation of determination. She knows what she wants and will stop at nothing to get it. I will always hold a place in my heart for Velvet Brown.